These are home-brewed observing logs I whipped up for the Astronomical League’s Galileo, Lunar II, Messier, Binocular Messier, Deep Sky Binocular, Urban Observing, Double Star, and Binocular Double Star clubs. The blank NGC log sheet contains no data, but has fields for everything you need if you’re working on the Herschel 400, Herschel II list, or another NGC-based project. Everything is in PDF format, click on the links below to download it all for free. Don’t worry, the downloadable versions don’t have my name on the cover. Please let me know if you find any errors. Please note that there are two versions of the Messier logbook: a long one (41 pages) with entries in the same order as the AL list, and a short one (21 pages) with entries arranged following Pennington’s Year-Round Messier Marathon Field Guide. Please be aware that the AL does not accept marathon observations for the Messier Club; the Field Guide order is still a useful progression through the Messiers, at whatever pace. Even the 21-page logbook is probably too cumbersome for a Messier Marathon – for 4-page and 1-page marathon checklists, please see my page of Messier Marathon tools. Also, I’m making these freely available, with no strings attached. 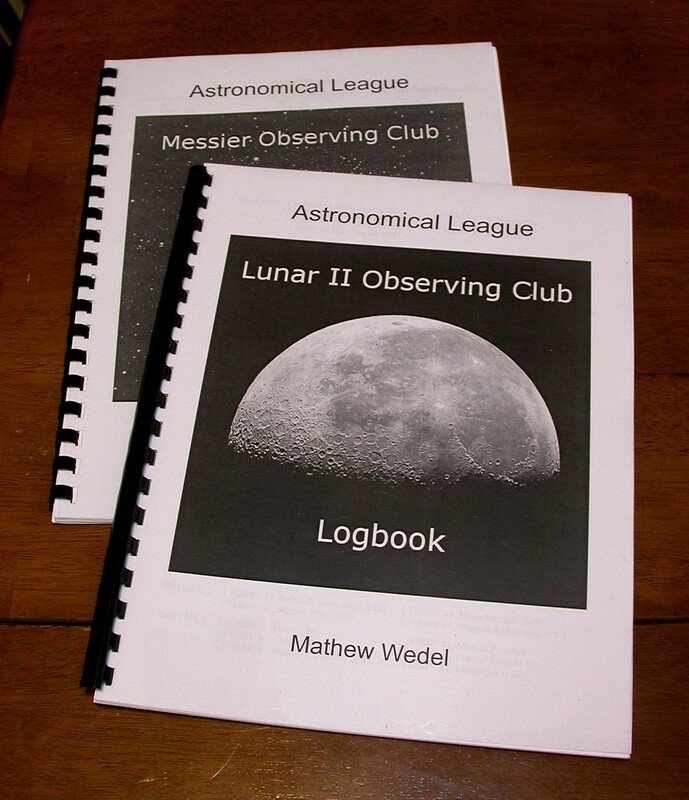 But I have one request: if you use one of these logbooks in completing an AL observing club (or a Messier Marathon), I would be most grateful if you would let me know, either by leaving a comment below or by e-mailing me at mathew.wedel@gmail.com. (If you’re really grateful, there is an easy, free way for you to support this blog.) Clear skies, and good luck! January 13, 2010: except for the original Messier Logbook, all of the deep sky logbooks now have RA and Dec coordinates for every target. January 15, 2010:added Urban Club logbook, and Messier Marathon, Binocular Messier, and Deep Sky Binocular logbooks now indicate which objects overlap among lists. February 9, 2010: added Double Star logbook. March 3, 2010: added Collinder Catalog. March 17, 2010: added Concordiem Australis by RA. April 7, 2010: added Concordiem Australis by Constellation. October 20, 2010: updated Collinder Catalog to v2. August 1, 2012: added Binocular Double Star logbook. Binocular Double Star Logbook (22 pages) Newest logbook, includes coordinates, chart numbers for both Cambridge Double Star Atlas and Pocket Sky Atlas, and a small sketching field for each target. Table of contents lists overlaps with regular Double Star Club and Urban Observing Club. Binocular_Messier_Logbook_v3 (21 pages) Identical to the Messier Marathon logbook below, but with a binocular-themed title and cover image. New version has coordinates, better data fields, and a table of contents. Deep_Sky_Binocular_Logbook_v2 (12 pages) Includes coordinates, Pocket Sky Atlas chart numbers, and data fields that are more logically arranged and easier to use. New version has a table of contents. Double_Star_Logbook (19 pages) Includes coordinates, PSA chart numbers, and a small sketching field for each target. Table of contents lists overlaps with Urban Observing Club. Messier_Logbook (41 pages) Original version with big description fields, no chart numbers, and entries arranged following AL list. Messier_Marathon_Logbook_v3 (21 pages) Slim version with small description fields, chart numbers for three popular atlases, coordinates, and a table of contents. Urban_Club_Logbook (19 pages) Table of contents shows which objects (80 out of 100!) overlap with Messier list and Deep Sky Binocular list. Collinder Catalog v2 (16 pages) This one isn’t my work; as explained here, all I did was convert to PDF form a list that Thomas Watson labored mightily to get into useful form. It also isn’t the subject of an Astro League club, at least not yet. But it’s an observing list and I didn’t have a more convenient place to archive it, so here is goes. Version 2 is based on Watson’s updated observing checklist, which corrects some minor errors in the first version. Concordiem Australis by RA (4 pages) This one is only barely my work; it’s a merging of the AL Southern Sky Binocular, Southern Sky Telescopic, and Caldwell (56 most southerly) lists, with duplicates removed. The title may seem familiar; it’s an homage to Stephen Saber’s Concordiem Borealis. Concordiem Australis by Constellation (4 pages) Same as above except for object order. Thank you for making those logbooks available! Just started a clog myself and am looking forward to using your list to find Messier Objects. Thank you for this list. I have been looking for something like this for a long time. I have the logbook for the AL Universe Sampler. Nice logbook. I appreciate your information, and built a sun funnel after observing it’s utility and ease on your website. Absolutely a great work for science. Nice work! But just a note that Messier Marathon and the League’s Messier Program are two different things. The Marathon is to find the object, identify correctly, and move on to the next. The League’s Program is meant to take time to compare magnifications of power, try out filters, and week out every detail you can in an object. Definitely not something you can do in 10 minutes time. Yes, as noted in the post: “Please be aware that the AL does not accept marathon observations for the Messier Club”. I’ll modify the text to make the distinction more apparent, though. Thanks for stopping by! I would like to get 12 log books for our club. Hi Miles, thanks for your interest. I’m not sure what you are asking for – do you want hardcopies of these logbooks? I don’t print or ship anything physically. Just download the files of the logbooks that you want and print as many as you like. Sorry if I’m misunderstanding your request. A quick thank you for your Lunar II logbook. I’ve been an inveterate ‘hater’ of the moon for years, since I see it as the ‘Great Searchlight in the Sky’. Even though I completed the Lunar I project, it did not instill in me an appreciate for my ‘enemy’ as the Lunar II project has. Thanks to your wonderful logbook, I’m really enjoying the moon! I’ve discovered that WHEN to look is as important as WHERE to look – that’s where your log book really shines. Thank you for sharing your hard work. As the Observing Chair for the Minnesota Astronomical Society, I’m encouraging our members to download your book and begin their own love affair with our night sky enemy. Wow, Jerry, many thanks for the kind words! You made my day. It’s funny, Lunar I was my first completed AL program, and since those early days I’ve gravitated more and more toward the deep sky, especially low-power, wide-field observing. But lately I’ve gotten interested in meteorites and the cratering record in the inner solar system, and that’s certainly an area in which ole Luna shines. So maybe it’s time I dust off my half-completed Lunar II logbook and get back at it. Thanks again for writing, and clear skies!